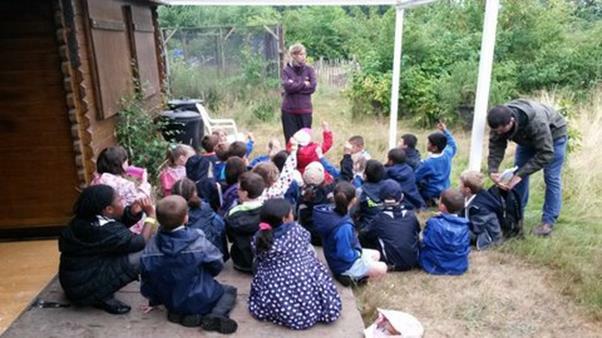 The Education Team would love to hear from schools and groups who would be interested in visiting Woodcroft Wildspace for an interesting and enjoyable educational experience. Please download the Woodcroft Wildspace Education Leaflet for full information. We also opened our gates for the Open Garden Squares weekend where visitors came to see Woodcroft Wildspace from across London, also visiting the Mission House garden on The Green before going on to visit other gardens around London. Whilst Woodcroft Wildspace is open 7 days a week throughout the year to wander in and enjoy the space, the Open Garden Squares weekend gave 76 visitors the opportunity of a personalised guided tour to see some of the rareties like Stag Beetles in flight. Our particiipation in the international Give and Gain Day has also been very strong with 6 industrial groups visiting over a period of 2 months to come and make a difference in the community, and to make a donation towards project materials at Woodcroft Wildspace. This year we have majored on water conservation to enable us to keep the ponds topped up and Organic Sensory Garden watered through the long summer drought. Woodcroft Wildspace has a "Community and Events Meadow" amongst our facilities.The meadow area is designed to accomodate things like school plays or small concerts as well as the familiar fete type of event - or perhaps a birthday party? Got some ideas ? Please e-mail us on enquiries@woodcroft.org.uk to come and be involved. We look forward to welcoming everyone to Woodcroft Wildspace. Thank-you again for your support.